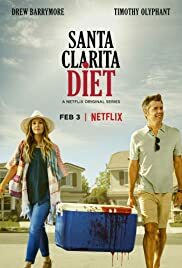 The comedy/horror themed Netflix original The Santa Clarita Diet is surprisingly enjoyable. The delivery of comedy from Timothy Olyphant and Drew Barrymore (playing Mr. and Mrs. Coby) is very well done in situations where stress should be high. It's been called a zombie film and it is hinted at that Mrs. Coby's condition is that of a zombie virus. However, she does not take on the traditional zombie form right away. She still looks normal, she is conscious of her actions and still goes to work. The only thing she needs is to feast on human flesh which is where most of the comedy comes from. Her husband is very supportive of her and helps her feed even though he is very uncomfortable with what they are doing. The comedy chemistry works really well between Barrymore and Olyphant which is kind of a stretch for Olyphant. Coming off of Justified this role is a good change for him and he does a really good job with his comedic reactions. Don't let the terms folks use to describe this show deter you from seeing it. It's been called a "Rom-zom" and things like that but it is definitely worth a watch. All ten episodes are streaming now on +Netflix US & Canada and there's cursing, gore and some toilet humor so mak sure your kids are old enough to get it, or get out.